If teaching and learning is going to stick, it has to get students’ attention and be meaningful to them. A young and energetic K-8 music teacher, Joe Vercellino calls on his diverse background, a ‘roll with the flow’ attitude and a flair for entertaining to build relationships with his students. He also leverages stickiness by creating a classroom experience that will not only get them to pay attention, but that will spread. “I want the kids to go home and say this is what my music class was like today“. That’s why classroom events and projects fill up his YouTube channel. 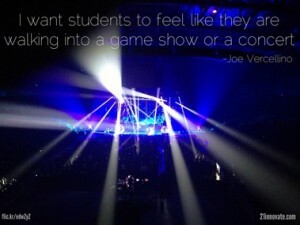 Joe is crazy enough to have his class go viral. Think all the hype and show doesn’t pay off for actual learning? Think again. Is that not what we want to happen in every classroom? “Now I’m really interested in _____”. Creating an experience that elicits interest is what leads to curiosity and a desire to improve. And it’s that level of engagement that allows teachers to help students push through the difficulties that accompany growth. Joe isn’t shy to admit that it’s not always butterflies and rainbows. He’s learning to be a better teacher; to balance all the demands and curve balls that get thrown at him. But when it comes down to designing his lessons, fun rules. In the end, of course, it’s not actually the YouTube views or the downloads on iTunes that really matter to Joe. Working in an urban setting, students who come to music class with Mr. Vercellino may not have had enough to eat the night before. They are likely from poverty. So he is relentlessly pursuing ways to make a positive difference in his students’ lives, and his modern methods are making it memorable for his students. In and out of the classroom, Joe creates eventful learning through music that is relevant and mentorship that is meaningful. “I think back to my middle school experience, and I would have killed to recorded an album, to produce music professionally…and that drives me to give them the experience I would have loved to have had”. Bringing together boys from different grade levels, Vercellino works before and after school with the Beasts of the Beat group to produce and perform hip-hop. Instead of ignoring or shunning the culture they have been raised in, Joe helps them to understand the power of their words and the life lessons that accompany the process. 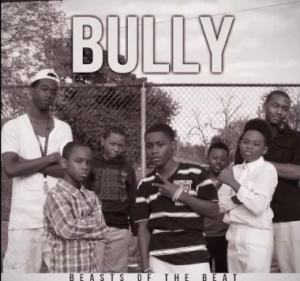 The group’s recent song, Bully, tackles the commonly discussed adolescent issue in a way which you typically wouldn’t hear. It’s raw and real, and I’d guess many teachers would not be comfortable with it. But listen to the voices of Joe and his students below and tell me that’s not exactly the type of energized, entrepreneurial spirit we want in our classrooms today. Joe is one of the crazy ones who believes he can change the world…and I, for one, am crazy enough to believe he just might. But it’s not the size of his students’ audience that makes me think that — it’s the size of their teacher’s heart. Update: Watch this local news feature on Joe & Beasts of the Beat!